In recent years, thousands of Burmese refugees living in camps in Thailand have been resettled in countries such as the US, Canada, Sweden and the Netherlands. The BBC's Vincent Dowd caught up with two ethnic Karen families who found asylum in the UK and whose stories were documented in the film Moving to Mars. 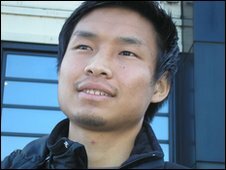 Htoo Wah lives alone in Sheffield where he has just started a four-year computing course at university. By the time he gets his degree, he is counting on finding a well-paid job in IT. The life he is leading is one he could only have dreamed of a couple of years ago - and he loves it. Until November 2007 Htoo Wah, now 21, lived in the huge Mae La camp just inside Thailand - the largest of several camps housing tens of thousands of refugees from nearby Burma. 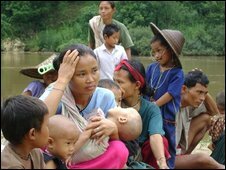 Most, like him, are from the Karen ethnic group - and have fled from the hard rule of Burma's military government. Two years ago Htoo Wah and his parents boarded a bus at Mae La bound for the Bangkok airport and a plane to their new lives in Britain - a moment documented in the recently-released film Moving to Mars. "Sitting on the bus I felt like I'd got freedom," says Htoo Wah. "I thought, I can do whatever I want. I don't have to stay in the camp any more - I'm going to the UK." Moving to Mars is the work of producer Karen Katz and director Mat Whitecross. 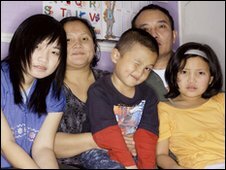 The film follows two Karen refugee families as they make the transition from the camp in Thailand to their new homes in northern England. The two families were provided by the office of the UN High Commissioner for Refugees and form a study in contrasts. Htoo Wah's father, Thaw Htoo, is a former civil engineer and teacher: he and his family speak good English and had some idea of what to expect in Sheffield. The head of the other family, Jo Kae, was an illiterate farm labourer with no English. They ended up living as neighbours in Sheffield. The film does not portray Sheffield as a paradise yet neither does it depict a Britain populated by violent racists. In fact Htoo Wah says he has encountered no problems with prejudice. "But I had difficulty with the accent. I had to learn that wa'er means water." He says he has found only friendly people, in contrast to Thailand where the family could barely leave the camp. "If we did leave people would talk down to us because of who we were." The migration has proved harder for the parents of both families, however. Htoo's parents, Thaw Htoo and Tutu Paw, started out full of optimism about their 10,000km (6,250 mile) journey to England but it was soon dented. At the end of the documentary Thaw Htoo starts a new course in engineering. But in the year since Moving to Mars was filmed, he has given up because he felt he lacked the computer skills required. His wife, Tutu Paw, still has not used her skills as a piano teacher in Sheffield. In fact, none of the four parents has found employment. Both Jo Kae and Daisi have learnt some English - but not enough to deal confidently with shopping, say, or the arrival of an official letter. But their three children - Di Di, Ei Ei and Seh Seh Lu - say they have started to enjoy Sheffield. Like Htoo Wah, they relish the personal freedom England offers them. In both families it is clear the parents were happier with their old lives in Thailand. What made them move was the desire which has long made parents uproot their lives - to give their children the economic chances they did not have. Yet that same decision comes to threaten the family ties they treasure above all else. Late in the film Htoo Wah announces he is leaving home to set up alone elsewhere in Sheffield. His parents are hurt and baffled at a decision which would never have been made in Burma. "Yes my parents were shocked when I told them," said Htoo Wah. "But in the UK most teenagers leave home at 18. Now I'm studying at university and they're proud of me." The two families' experiences show that migrants are not always victims. But it seems that often older migrants can only look on as the benefits of moving to a wealthy country go to their sons and daughters.